We are very excited to announce that we are going to start having music at Art for the People! Listen to music, peruse the art, and enjoy yourself! Donations at the Door Appreciated ! MUSIC & ART! WooHoo!!!! Art for the People is celebrating our 3rd anniversary with a 2 day Festival of Fun! We begin the Fun! with our 3rd Music is Happening on Friday with Erin & Evan (7p-10pm) and continues onto Saturday (12N-5pm) with 3 artists from 3Ps (Pets, People, & Places) (our current exhibition) who will be sharing their expertise and demonstration of their artwork. Festival of Fun (part 1) - MUSIC is Happening! 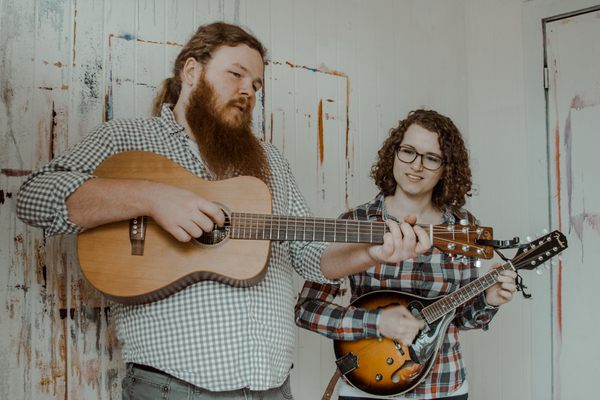 Erin & Evan are a folk duo from Austin and San Antonio, weaving together intricate vocal harmonies and tight instrumental playing to create a new take on the folk tradition. With distinctive original songs and a few choice covers, Erin & Evan can fill a room with melody, warmth, and heartbreak. They play frequently across central Texas, and they will be releasing their first album in the fall of 2017. Festival of Fun (part 2) - Art Talk & Demo! The creation of art is mesmerizing & we have three magnificent artists who will demonstrate and discuss what they love to do! Bryan Macilko uses encaustic which is a blend of beeswax and resin (with additional pigment added) to bring landscapes and animals to life. Through the use of scratchboard & tools, Connor Teseny creates texture and images of animals in nature that are based in photorealism. Through Katie Ryan Donohue’s love of animals & nature, she is magical with her talent with watercolors and envelopes a story of art utilizing her experiences & her imagination. Here we go with our 2nd MUSIC is Happening! LIVE ART! by Helena Martin! Art for the People will be showcasing the talented acoustic duo, Erin & Evan (who is exhibiting in Abstract Absolutely), for our second MUSIC is Happening on August 18th. Erin & Evan are a folk duo from Austin and San Antonio, weaving together intricate vocal harmonies and tight instrumental playing to create a new take on the folk tradition. With distinctive original songs and a few choice covers, Erin & Evan can fill a room with melody, warmth, and heartbreak. They play frequently across central Texas, and they will be releasing their first album this fall. Accompanying the music we will have live art starting at 7:00pm. The fabulously talented artists, Helena Martin & Emily Ding (who are both exhibiting in Scene Builders) will be sharing their painting process with us with Live Art. Come and Celebrate multiple genres of art!!! We are proud to announce that Buddha’s Brew is sponsoring this event with their delicious kombucha! We will be serving our unique kombucha cocktail. We LOVE Buddha's Brew Kombucha and are looking forward to creating a delicious cocktail! We love the unique taste of Revolution Spirits' Austin Reserve Gin!! Join us for our 1st EVER, Music is Happening! What’s happening at Art for the People?? MUSIC!!! We are upping our game & showcasing Cornerstone Acoustics for our 1st Music is Happening on South 1st. 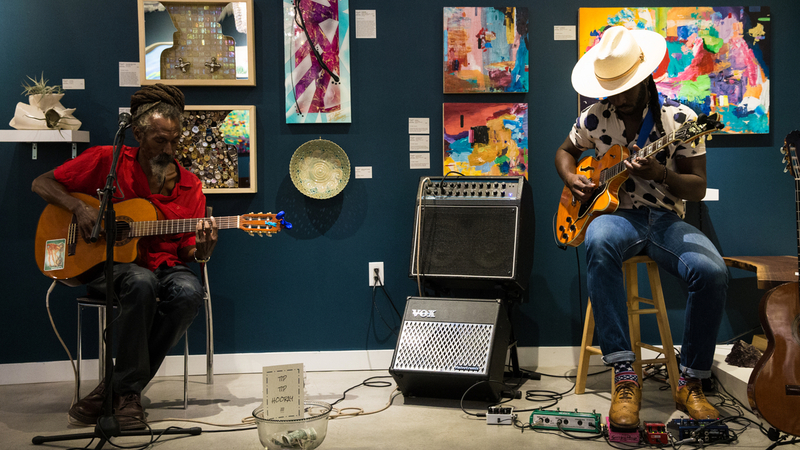 Cornerstone Acoustics “describes itself as where uptown meets downtown and rocker meets blues—reggae got soul.” Come & enjoy a night of music in the stellar gallery of Art for the People. Sip on a carefully crafted cocktail (it’s a secret recipe), visit with friends & artists, swing your hips & groove to the beat of Cornerstone. Local & Fabulous. Music & Art. Fun & Happiness. 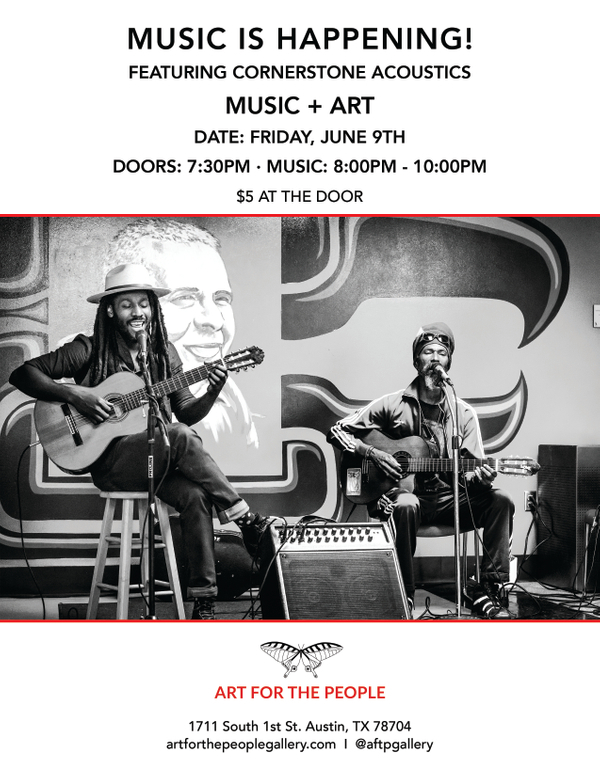 Duo, Akin Francis & Jorge Campuzano, will be doing an acoustic set, blessing us with some roots, rock, reggae!